When John Betjamin visited the Valley of the Racehorse, he captured his thoughts in a poem called Upper Lambourn. It’s probably not one of his best, and certainly not one of his better-known pieces. He takes us to the tomb of an unknown trainer who, in 1923, trained a hundred winners. Was it a real person or was his imagination at work? Probably the latter, as the poet had added a final “e” to the village name. Moving out of sight and mind. Racing has been the lifeblood of Upper Lambourn for many years, with the first recorded meeting taking place in 1731 on land owned by the 3rd Baron Craven on Weathercock Hill. The Craven family maintained an interest in racing for almost 200 years, with the 6th Baron becoming a member of the Jockey Club. His support for racing in Newmarket led to the setting up of the Craven meeting in 1771, although the race named after him was not run until 1878, coincidentally, the last year racing itself took place in the village. Since then the Lambourn area have become established as a major training centre, and more than 50 trainers have their stables there. That might have all changed but for the skill and bravery of an American Airforce Pilot. 2nd/Lt Lawrence Berkoff received a posthumous award of the Distinguished Flying Cross for his action in steering his burning aircraft away from the village. Berkoff and his crew were flying a B-24 Liberator from their base in Northamptonshire to drop supplies to the French resistance when an engine caught fire shortly after take off. Although the flames initially died down, they re-appeared as the plane crossed the Channel, and so Berkoff set out to return to base. As the plane lost altitude, he ordered his crew to bail out, leaving him alone to try and get home. He could barely maintain control as the plane headed towards Lambourn, but Berkoff managed to steer his plane away from the houses. It crashed into a field next to Folly Road, barely 200 yards west of the centre of Lambourn village. Berkoff was killed instantly. There would be a sort of logic in a horse called Upper Lambourn being bred or trained there, but that isn’t the case, despite at least a dozen trainers having their stables in that part of the Valley of the Racehorse. Instead, he runs out of Chris Kellett’s small yard on the border of Derbyshire and Leicestershire. He was bred in Ireland, but in his early racing career did have the village connection, as he was in Jamie Osborne’s Upper Lambourn yard a couple of years ago when he first raced. After a spell at Brian Ellison’s Malton yard he went to Chris Kellett last November. Today he runs in the opener at Southwell, just up the road from home, and a course where he has run 11 times, and all four races he has won have been staged, one of them for Kellett. Mind you, they have all been over sprint distances, whereas today he’s running over seven furlongs. 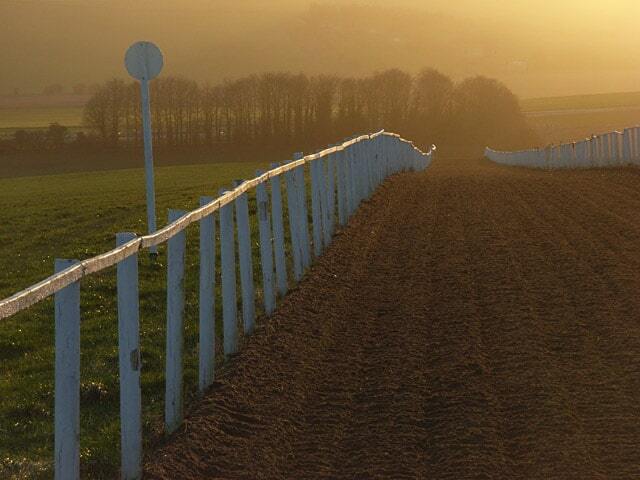 Upper Lambourn has raced in England, Scotland and Wales, but never at Newbury, the closest track to the village. Mind you, if he seems a much-travelled animal, it’s nothing with another horse his owners The Edwardsons have with Chris Kellett. That one’s called Spacecraft, so who knows where he’ll go?